America’s truck drivers rely on Mytee Products for high-quality cargo control equipment and supplies. Why? Because we have everything that the average truck driver needs to get the job done. Furthermore, we might be able to find a unique piece even if it is not included in our standard inventory. If you are building an inventory of cargo control supplies for your truck, it is a good idea to sit down and assess what you would need for the kinds of jobs you normally take. Visit a couple of trucking forums and ask for advice too. Other truckers will be happy to tell you what they recommend. We can offer a bit of advice thanks to the time we have spent serving the trucking industry. We believe the items listed below make up the foundation of a good cargo control inventory. Keep in mind that we carry all of them. You can purchase online or visit us in person. Winch and ratchet straps are straps used to secure heavy cargo to flatbed trailers. Both are made of heavy duty webbing material and come in a variety of lengths and working load limits. The only difference between the two is how they are applied. A winch strap is attached on one side of the trailer and secured to the other using a winch. Ratchet straps are secured using ratchet devices. The average trucker will need an adequate supply of both due to the fact that both winch and ratchet systems are used throughout the logistics industry. Exceptionally heavy cargo that needs to be secured with something more than winch and ratchet straps may require heavy-duty chains with higher working load limits. G70 chains are standard in the trucking industry. Truckers can use these chains to secure everything from concrete piping to steel coils. Along with chains are the binders needed to make sure they are tightened down. There are several different styles of binders to choose from, so drivers have to consider what works best for them. Once again, Mytee has a full selection of chains and binders to choose from. Truckers typically do not use bungee straps as a means of securing cargo firmly to the trailer. Rather, bungee straps are deployed for keeping tarps in place. Having an ample supply of bungee straps is always a good idea given that you never know when one will break or be lost. And because they are inexpensive, buying them in bulk is generally not a problem. A good cargo control inventory is not without a complete selection of corner and edge protectors. These seemingly small and inconsequential pieces can actually be critical to getting certain kinds of cargo to its destination undamaged. Corner and edge protectors keep individual pieces of cargo safe from damage that could otherwise be caused by road vibration, cargo shifting, and the application of chains and straps. Corner and edge protectors come in a wide variety of shapes and sizes. It is up to the trucker to determine what he or she needs for the kinds of loads typically carried. We are happy to say that corner and edge protectors are very inexpensive, like bungee straps, so buying in bulk ensures you always have enough on hand. So there you have the basics of what a good cargo control inventory looks like. Feel free to add to your own inventory as you see fit. Whatever you do, remember this: the supplies you use to secure cargo matter. So choose wisely. The term ‘cargo control’ is one that every truck driver should be familiar with. Experienced truckers know what it means and how it applies to their daily jobs. New truckers may understand the term, but only experience will teach them the finer points of cargo control. Mytee Products serves the trucking industry with a complete inventory of cargo control products. Each of the products we sell is intended for a particular purpose. The benefits of these products are maximized when truck drivers understand the basic, fundamental principles of cargo control and how to apply them correctly. Those fundamental principles are explained below. The foundation of cargo control is preventing cargo movement while a truck is en route. How cargo is secured depends on its shape, size, weight, and position on the truck carrying it. For example, large coils of steel cable need to be secured in a particular way because they are prone to rolling as well as shifting from side to side. A trucker may use a combination of chains and blocks to keep the coil rolls in place. Movement must be restricted in all directions. It cannot shift forward or backwards when accelerating and braking, and it certainly cannot be allowed to shift from side to side. Therefore, cargo might have to be secured from multiple angles to prevent all movement. The second fundamental principle of cargo control is restricting road vibration risks. Physics dictates that road vibration cannot be eliminated, so the idea is to prevent any such vibrations from causing damage to cargo. This can be accomplished in a number of ways. Cargo can be properly spaced on a trailer so as to avoid direct contact between multiple pieces. In addition, truck drivers can use edge protectors and spacers in situations in which cargo has to be tightly packed. Even moving blankets and tarps can be used strategically to minimize the risks of road vibration. • It reduces the likelihood that a trailer will become unstable. • It reduces the risk of cargo shifting en route. • It makes maintaining driver control easier. • It increases fuel efficiency and reduces wear and tear on equipment. Proper distribution of weight is critical to the safe and efficient transport of cargo. Furthermore, drivers need to get it right the first time. If a trailer is fully loaded and found to be out of balance, it may have to be entirely unloaded and done over. This is a waste of time and money. Last is the principle of protecting cargo in a general sense. Beyond movement and road vibration, certain kinds of cargo have to be protected against environmental exposure. Thus, truck drivers use things like tarps and blankets to protect against weather conditions, road debris, and animals and insects. A typical flatbed truck driver will keep a good supply of these kinds cargo control supplies on board. He or she may have several different types of tarps for example, including lumber, steel, smoke, and general purpose tarps. He/she will also keep a selection of straps and bungee cords on board for securing those tarps in place. Cargo control is a fundamental concept of truck driving. It is something that every truck driver has to learn, both in the classroom and through real-life experience. Those who master it are capable of moving cargo over thousands of miles with minimal risk. A portable, fabric carport from Mytee Products is a great tool for protecting your car or household equipment from the elements. We sell carports and storage buildings in a variety of styles and sizes that can accommodate everything from the family minivan to a full-sized RV. We encourage you to browse our inventory while you are here. Like anything else, taking good care of your carport will keep it looking like new for years. Just a few, simple maintenance practices will add years to the life of your carport by minimizing the damage caused by weather and time. Below are some helpful tips that we generally recommend to our customers. 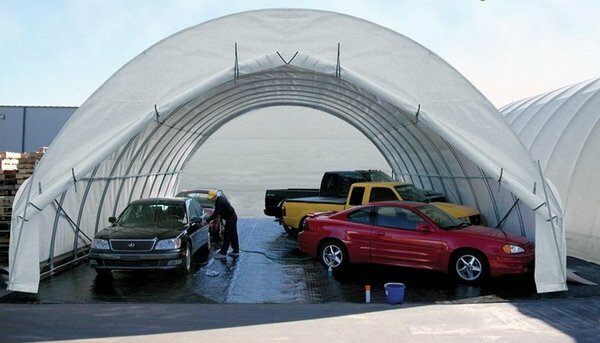 The fabric used for manufacturing portable carports is usually either polyethylene (PE) or polyester. We prefer PE because of its strength, durability, and weather resistance. In either case, you are going to want to keep the canopy clean if you want your carport to look like new for as long as you own it. Routine cleaning can be accomplished with warm, soapy water and a light detergent. Good detergent choices include things like laundry and dish soap. A gentle car wash detergent will also work well. The one thing you do not want to use on your canopy is bleach. Bleach damages all sorts of canopy fabrics along with stitching material. Also make a point to stick with nonabrasive cleaning solutions. You should reserve abrasive scrubbing for persistent stains and mold or fungus growth. Our carport frames are made of heavy-duty, galvanized steel for maximum strength and weather resistance. But even galvanized steel needs to be cleaned from time to time. Thankfully, doing so is simple. Surface dirt can be washed away with a mild detergent and some warm water. You could clean the frame the same way you wash your car: gently wipe dirt with the soapy rag then spray everything off with a garden hose. If your cleaning has to take into account more aggressive stains or things like oil and grease, you will need more than just soapy water. You can purchase commercial steel cleaners normally used in the kitchen. These can be applied with an old rag and gently wiped away. As an alternative, you can use distilled white vinegar and boiling water. Just be sure to use protective gloves so you do not burn yourself. When you’re done cleaning, be sure to wipe away any remaining water so as to prevent rust or water stains. A thick, dry cloth is all you need. Vinegar can be used to remove water stains should you miss any water during the drying process. The steel frame is the skeleton of your portable carport. You should be addressing general maintenance in addition to just cleaning the frame. This includes regularly inspecting all the fasteners and joints. Make sure to tighten any loose fasteners right away. You also want to check whatever means are employed to fix the canopy to the frame. Make sure all of them are secure. Should the fabric of your canopy tear or develop a hole, don’t panic. PE fabric can be repaired with a commercially available patch kit. Just clean the area around the hole or tear and apply the patch according to the instructions on the packaging. It is fairly simple. You have invested a significant amount of money in your carport. Do not let that money go to waste by not taking good care of your investment. By cleaning and maintaining your carport on a regular schedule, you will keep it looking and working like new for years. On any given day throughout the country, an army of tow-truck operators takes to the roads with a single mission of helping stranded motorists recover their cars. It is often a thankless job that does not get enough attention when folks are talking about career options. Nonetheless, tow-truck operators contribute to the fabric of the U.S. economy by providing a very valuable service. What you may not know is that being a good tow-truck operator requires more than just knowing how to load a car onto a flatbed or hook it with a tow bar. It also requires the right equipment. It requires knowing how to use that equipment within a variety of towing and recovery scenarios. Using any of the items listed above requires a good understanding of working load limits (WLL). Pieces should be stamped with a WLL, which should not be exceeded. Experienced tow drivers know that WLL can be maxed out when you are talking about securing a stationary vehicle for transport. The same cannot be said during a recovery operation when pulling a vehicle out of a ditch or through a snow drift adds to the load. A general rule dictates you need more equipment with higher WLLs for recovery than for transport. In the arena of vehicle transport, there are multiple scenarios to account for, each with a unique equipment list. A tow operator may be hauling a wrecked vehicle on a flatbed or with a tow bar, and have no real need to protect the car due to it being a total loss. Then there are repossessions and basic transport of classic or exotic cars. Like with towing and recovery, WLLs have to be part of the equation when securing a vehicle for transport. Additionally, tow operators need to know how to hook and secure cars without damaging anything underneath. This is not as easy as it sounds. One car may be okay with grab hooks on the axles and straps around the tires, while another should never have anything on the axles. It should be clear that the best equipment in the business is only as good as a driver’s knowledge of how to use it. Therefore, the last thing the tow driver needs to be very good at what he or she does is a strong knowledge of how to use every tool in his or her box in the best way possible. A good tow truck operator is like an engineer. He or she understands the mechanics, he/she has the tools, and he/she knows how to apply both to get the job done. Mytee Products is honored to be able to serve America’s tow-truck operators with a full line of auto towing supplies. We have everything tow truck operators need for towing, recovery, and transport – from chains to hooks to auto hauling straps.